RANTWICK - Commuter Cycling in London Ontario | A Bike Blog: TARATS is OVER. You can end the contest now, we have a winner. 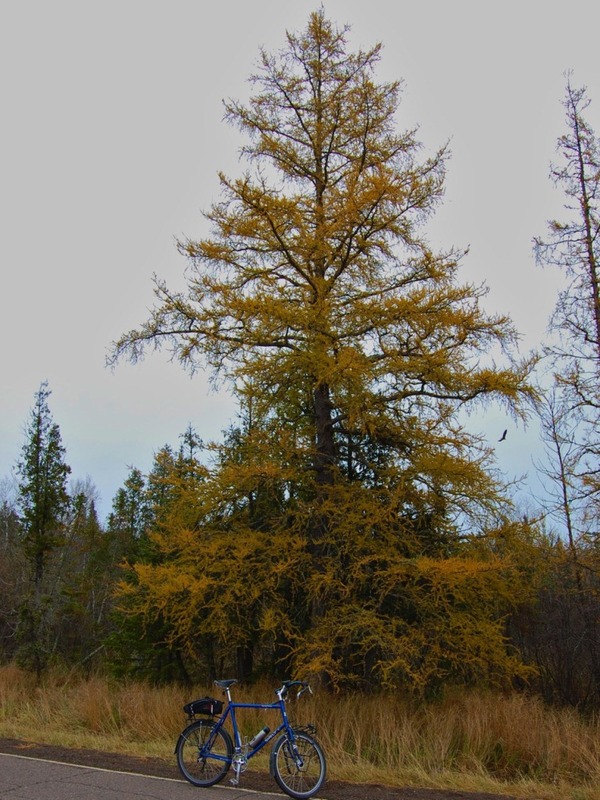 I came across this beautiful Tamarack five miles north of my house just outside of Duluth. Last year, I tried to garner enough votes to win by including my dog in my picture. That didn't quite push me over the top, so this year the dog is out and the bike is in. In case that's not enough, I even arranged to have a bald eagle flying in the background. Minnesota is now represented. Did I mention the contest is over? Visit the entrants page to see the trees this one is up against, including a nearby tree in Wisconsin. I bet those two trees HATE each other, man. Good thing they are rooted in the earth; limbs would fly for sure. I must say I thoroughly enjoyed the tone of this email, since this is a SMACKDOWN. Thanks for getting into the spirit, Darin. That Tamarack is a beauty, for sure, and a bonus bald eagle is pretty stinkin' good too. It is my sincere hope that some of you beg to differ with Darin about this tree being the winner, such that you send in your own tree for comparison. To those of you who have already entered, many thanks. The deadline remains 11:59 PM Eastern on December 15, 2012. Apologies for being absent again lately; life trumps blog, blah blah blah. I'm pleased to be able to post again and hope to make some more regular updates.